We have been noticing this naval ship docked at a ship repair shop across from our studio for months now so we decided to look it up on Google. 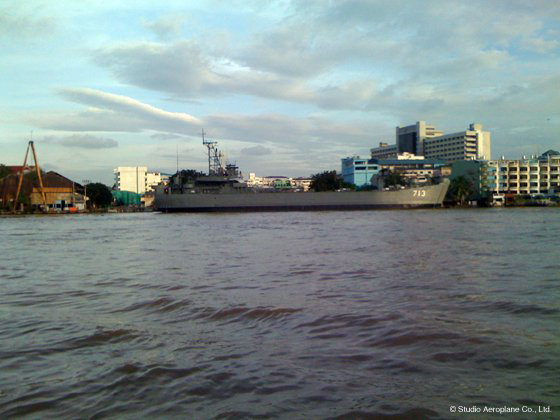 It turns out that this ship, named “Phangan Royal Ship,” is a naval ship given to Thai Government by the United States Government under Military Assistance Program (MAP) in 1959. She is one of four large-scale naval ships owned by Royal Thai Navy and has served in Vietnam War. Phangan Royal Ship has been retired from its service since June 5th, 2008. She will be transferred to a memorial site at the Royal Rama IX Museum on Phangan Island, Surajthani. There is no information yet on when the memorial will be open to public so stay tuned!